Here you can find bridal jewellery. 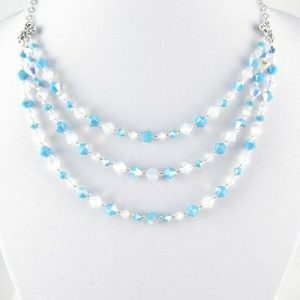 Turquoise and opal necklace necklace & earring set for brides – handcrafted with Japanese seed beads and Swarovski bicone crystals. The earrings hang on Sterling silver ear wires. The necklace closes with a lobster clasp. 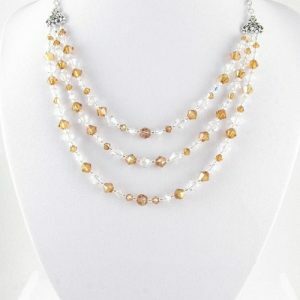 Copper and silver necklace & earring set for brides – handcrafted with Japanese seed beads and Swarovski bicone crystals. The earrings hang on Sterling silver ear wires. 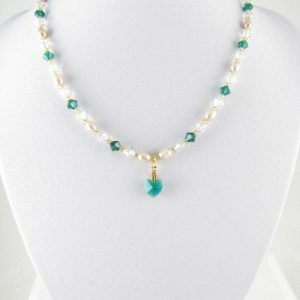 The necklace closes with a lobster clasp. 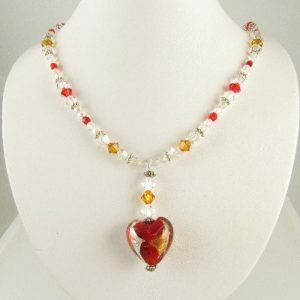 Red heart necklace – handcrafted with a red, gold and silver lampwork heart, Swarovski bicone crystals and fire polished Czech beads. The necklace closes with a cute Tibetan silver heart toggle clasp.